The evolution of the Pathfinder Roleplaying Game begins here! The rules in this book pave the way for next year's Pathfinder Second Edition, but we need your help to test and polish them for final release. The new rules make Pathfinder easier to play and learn while still providing the breadth of options that have made it one of the most popular tabletop roleplaying games of the last decade, allowing you to create the character you want to play and craft the stories you want to tell. Your feedback will help to evolve the game even further. This 432-page rulebook contains everything you need to create and advance your Pathfinder Playtest character from level 1 to 20, as well as hundreds of new and updated spells, magic items, feats, and Game Master rules necessary to run a complete Pathfinder Playtest campaign! Delve the deepest dungeons with a brand-new goblin alchemist hero, or convert your favourite existing characters to the new system! 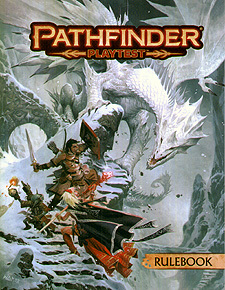 With gorgeous interior art from Pathfinder cover artist Wayne Reynolds and new rules concepts on nearly every page, the Pathfinder Playtest Rulebook is your gateway to the future of Pathfinder. Your next adventure is about to begin.